Hi Colin Gallimore, my name is Charles Whalley, me and my brother Edward also played on the concrete on fairfileld high school hockey pitches playing football. We lived on brunner street the next street down from the concrete, I know all the people you mentioned in your post and other friends billy beswick,geof and bobby underhill,alan boardman, gordon wilks and dave leonard was a good table tennis player when i knew him. 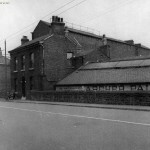 I also went to east manchester lads club and ancoats lads where we had an excellent football team, all happy days. Hi Colin Gallimore, my name is Charles Whalley. I’ve done everything you have mentioned in your post, me and my brother Edward played football on the concrete on Fairfield High school hockey pitches. We lived on the next street down from the concrete on Brunner Street, we knew your brother Alan and we knew all the people you mentioned. Some other good friends we played with at that time was Billy Beswick, Geof and Bobby Underrhill, Alan Boardman and loads more. 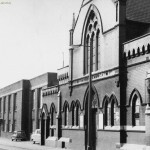 I also went to east manchester lads club and ancoats lads club, all happy days. Its absolutely amazing how much houses have moved on! I just tried to look at the youtube link that you posted last September, and it was no longer available. Is there an alternate page, or should I delete the post? I lived in cherry league street early sixties until 1975.I remember George,Shane and Neil.played football every night on the concrete and Fairfield high school.remember Rob.Jackson Tony Boswell Stuart Dixon Gary Davies Ronnie booth the list is endless.does anyone remember east Manchester lads club ,think Dave Leonard and Brian snowfield used to go. I lived off Louisa st. In boscastle st.i went to Clapton brook and then went to wheeler st. I then went working at g.e.c.i remember Brian scow field very well my brothers Alan and Bobby also went to wheeler st.as did Brian burton and Danny Martin. 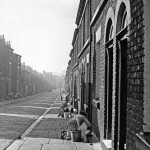 I lived in Stanhope Street back in 1946 to about 63. 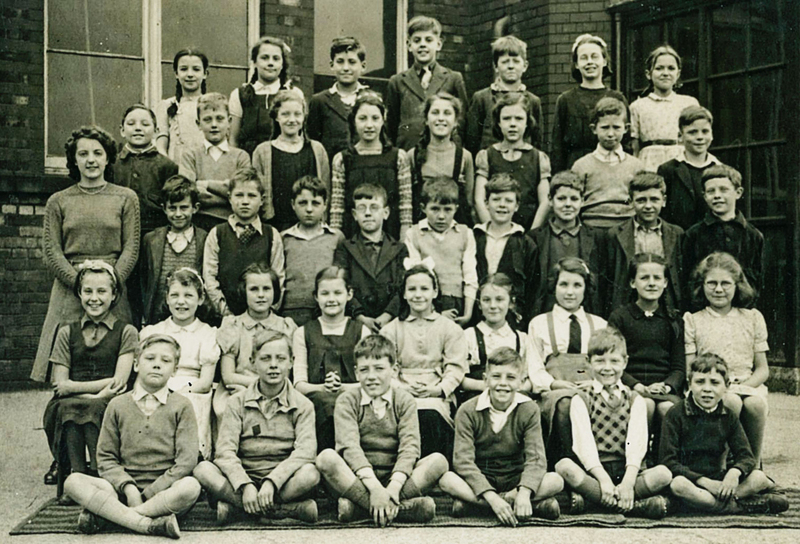 Went to Wheeler Street school, right from nursery to senior school, left in 1958. My grandparents were Peter and Kenvyn Collins and my mum was Doris. Old school friends were Glyn Edwards, Len Healey, John Daly, Tommy Manion, Albert Pike. Doubt whether there are many of my age group left now sadly. I haven’t been around the area for many years. Now living in North Wales. If anyone is still out there, would love to hear from you. Thank you derek. I will take a look at that Facebook page. 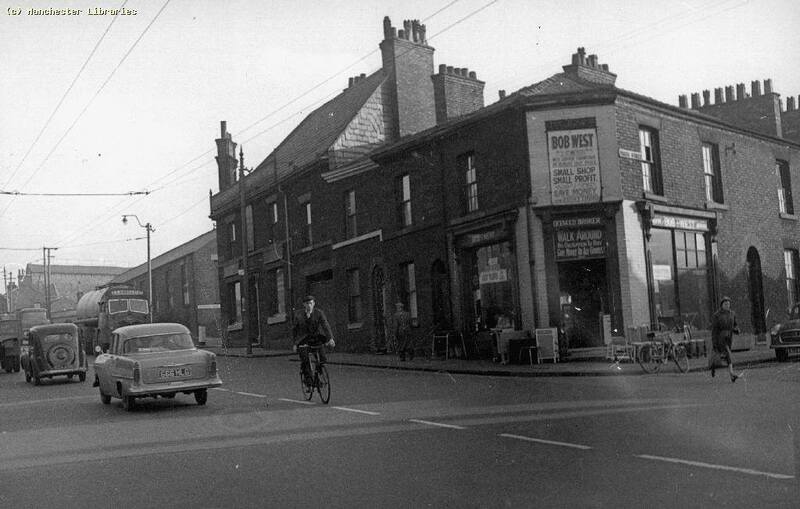 Some good memories there of Openshaw in the 50s and 60s, and how close knit the community was in those days. Relatives close by, and neighbours looking out for you. Sadly destroyed and spread far and wide. A reality check, though–the houses were small and outdated by this time, and improvements were needed. I just think it could have been done in a manner that didn’t destroy communities. If you’re looking for pictures of Openshaw from that time, I suggest you join the Openshaw Facebook page. It’s a closed group, so you need to get permission to access it, and there are lots of great photos there, mainly from a chap called Bob Robby. 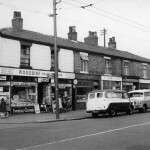 Just found this site whilst looking for photographs of higher openshaw in the 60’s. I was born at no.2 harp street (directly opposite belsize garage) in 1961. This was my grandparents house, George and Sarah (known as kitty) Scowcroft. My grandad had very poor eye sight and worked at dunlops. He had an allotment at debdale park I think it was. 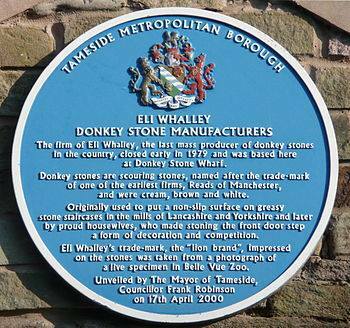 My mother was sheila wheeldon (nee scowcroft) and we lived round the corner on tunstall (tunstill?)street. My uncle born in the early 50’s is Brian Scowcroft, a big biking fanatic. 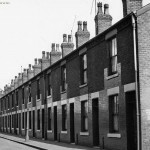 We were rehomed in the mid 60’s to Heywood as part of the slum clearance project. My grandparents stayed on at harp street until my grandad died inthe early 70’s, by that time we had moved to denton where my uncle bought a house accross the road from us and my grandma found a flat down the road in Houghton Green. Sadly my mum passed away in 1985 aged 42 from cancer. My dad, Barry Wheeldon (originally from Mellands Road,Gorton) is still going strong as is my wonderful Uncle Brian (i had a bit of hero worship going on there!). My grandma’s sister Alice also lived in the area, her husband was Fred etches and their children were Dereck and Lynn Etches. If i remember rightly my maternal great grandma lived on printer street it was opposite a nursery I attended in the early to mid 60’s. I remember wonderfully friendly neighbours and being given sixpence by my grandad to spend at the local sweetie shop. I can’t remember the road the shop was on but I do remember walking up harp st to a road that ran directly behind belsize garage and came out near redmonds on ashton old road. The sweet shop was just before you turned onto ashton old road. If anyone has any photos of this area and any memories or photographs of my family I would love to hear from you. My email address is karen.l.stevenson@ntlworld.com . Just found this site and find it fascinating. I went to Varna Street school in 1960 and remember Mr and Mrs Davenport and Mrs Smedley.. l then moved onto Wright Robinson. As Children we all walked to school from Jetson Street on our own. We lived at 78 Jetson st. Gorton. Does anyone remember Dr O’Driscoll on Capital rd.The bakers shop near delamere Park. 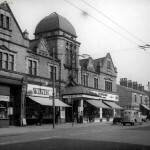 My older sister went out with a guy called Joe who’s parents owned the fruit shop on Abbey Hey Lane there. My dad was called Wallace and played the piano at any local pub that would pay him..bless him as there were seven mouths to feed plus him and mum. Would love to hear from anyone that remembers me. John Marsden is still in the area along with brothers Fred, Dave and Glenn. I grew up in Openshaw. I lived at 13 Vincent Street and my best Friend was Raymond Selby who also lived in Vincent Street.. I attended Elysiasn Street School then Ardwick Technical High School. I spent most of my childhood playing football in George Street Park and the Lads Club. David Wagstaffe was a good friend, who went on to play for City. Very proud of Openshaw background. To Chris Swindell – Hi Chris lovely to read that you are Tommy Torr’s Great Grandson. 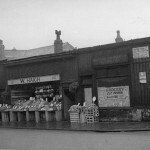 My Grandmother, Georgina Cronshaw, was Tommy’s sister and she and her family also owned Greengrocer’s shops along Ashton Old Road and Fairfield Wells. My Mother worked in the shops but, after my Grandfather, who unfortunately had died before I was born, had passed away, they had to sell the shops. 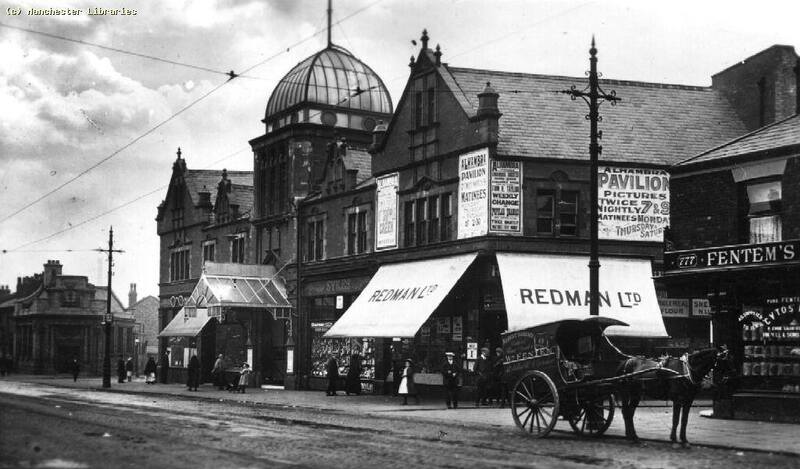 My Mother and Father moved to Audenshaw, along with my Grandmother. 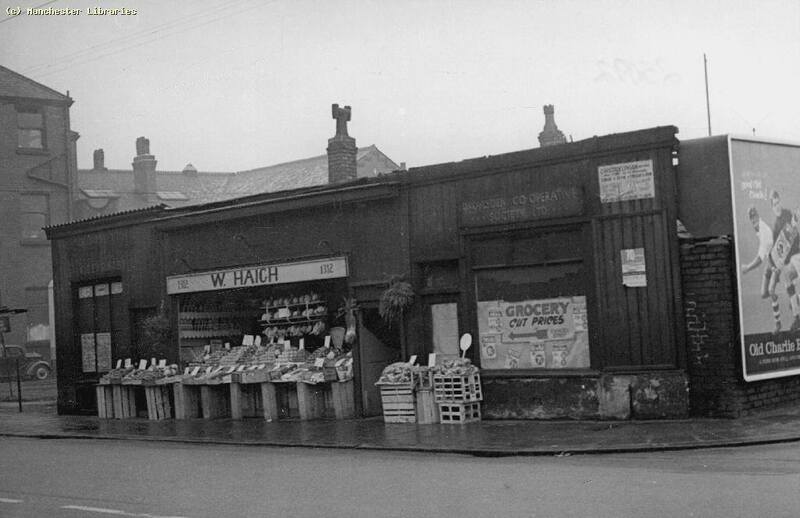 We all lived near the Trough on Audenshaw Road until the 1970’s. 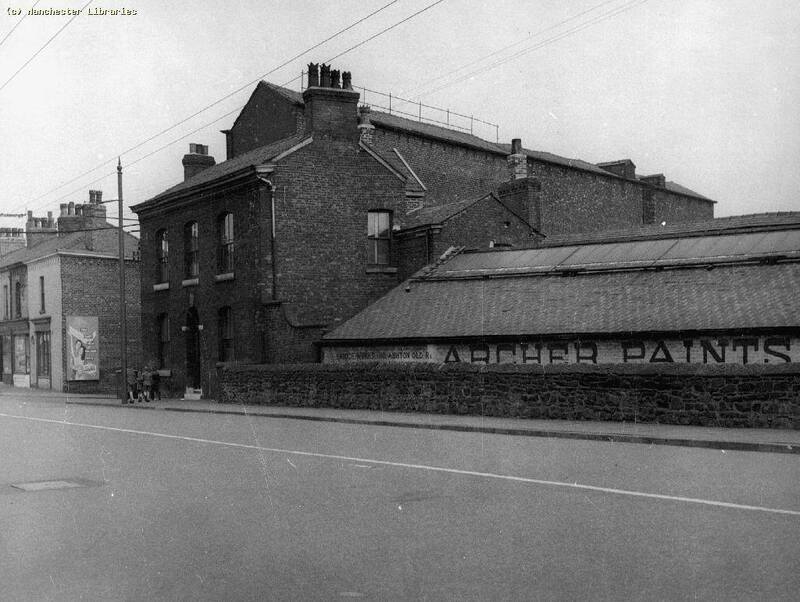 Since my marriage I have lived further along Audenshaw Road, close to the Old Blue Pig on High Ash Grove. Be good to hear from you. Hello Shane, I know everybody on that list of names, I’m Charles Whalley and I went to school with every one of them. Did you have a couple of brothers because I played football with a couple of lads called Massey from Ambush Street, my grandad lived on Bowness Street did you know the Underhill’s Jeff and Bobby who lived on Silverdale Street? Bye for now Charles. Very interesting, reading the above comments. My name is Shane Massey and I lived in Ambush street, until about 1980. I know a lot of the above names but can’t picture the faces unfortunately. I went to St Clements infants, junior and senior schools. Mr Lees was the Headmaster of the secondary school. Name I remember; Wilks, Cunningham, Boardman, Beswick, Whalley, Dixon, Digman, West, Waterhouse, Galimore, Jackson. I now live in Yorkshire and work part time. I would really appreciate a photo of the “tin hut” on AOR . St Clements infants school. PS my class teacher at St Clements was Mrs Lister. Hi Shane, When I was first at St Clements, Mrs Lister was not married and known as Miss Bostock. Mr Lees followed Mr Milne. I have mentioned the other teachers I remember elsewhere. I do have a photo somewhere of the class outside St Clements big school. I would have been about 11. I think it was for the Coronation Day Choir. I remember walking across the main road from the school with a red tin full of the children’s dinner money to the shop where it was “changed” for larger denominations and then took it back to school. I was the dinner money monitor. Can you imagine anyone being allowed to do that at the age of about 12 nowadays.? Its very interesting reading all of the above memories and comments . BRIAN WILKINSON, I think you were in my class at Elysian St . Along with the likes of John Needham, James Carter, George and Edward TRUE . ( twins who were nothing alike !!) Thomas Brierley. Barry Potter, Johnny Marsden .Susan valentine susan aldred jan lennard , Karen Singleton …many more BTW ?. NEw Islington was actually called that back in the 1920s . MY Dad used to swim in New Islington Baths between WW1 and WW2 … Most people think its a new name but its there on the old maps. The following are a description of three blue prints /drawings of past pubs. All are available to a group for historic protection. I would like these to go to a safe place for the benefit of future archivists if deemed relevant. Any suggestions ? labelled Band Shed. Not sure if this was for band practice as Beulah Hall was next door in Beula Street. Maybe some one else has further information if deemed useful. Drawing headed Openshaw Brewery Co ltd. Last info was that it was now a Tanning Salon. Condition good. 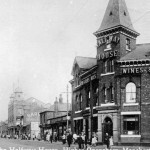 Also a blue print of The Half Moon Inn Major street Manchester. (Between Aytoun St and Princess st) Re proposed New Roof and sundry repairs. Drawing number 2411. originally property of Openshaw Brewery Co Ltd. CK & TC Mayor, Architects , 41, John Dalton Street Manchester. Now either a car Park or under a new build of offices. The specific location is not known. Condition good. Thirdly off licence drawing 591 7 Albert street, Withington by Leonard Marsland from the company of Ernest Ogden, Architect and surveyor 41 corporation street. 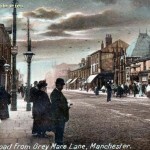 Manchester July 1906, condition fragile . Now believed to be a grassy bank next to new build properties, 11 Strathblane close Withington. For present location, Encompassed by Hill St /Davenport Avenue / Wilmslow Rd/ Copson St. I hope the above information will be of use to a specialist group. I lived at the Jenny Lind pub in Openshaw with my mam and dad Thomas and Ethel Fitzgerald from the late fifties into the sixties. 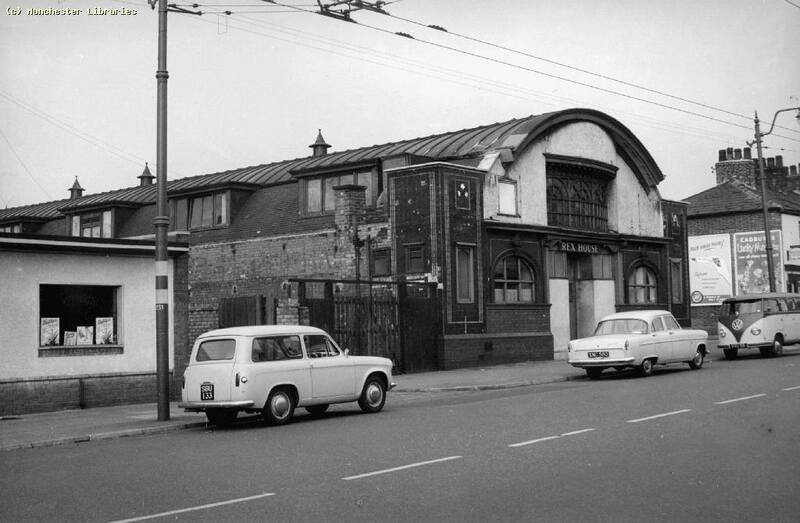 When we left the pub my mam and dad became stewards at the working mens club on Cornwall Street, not the Loco. When we moved into the Jenny Lind, of which i have a photo, there was a men only vault, with spittoons on the floor which my dad soon got rid of. There was a Manchester dartboard, dominos and cribbage. There was a small snug with a piano used by the ladies. Eventually the vault was opened up to ladies as well. The beer was delivered on a cart pulled by two horses and then the barrels were rolled down into the cellar. Do any of guys have a photo of St Clements School, the big school as we used to call it not the little school across the road. After living in Australia now for 42 years I find myself reminiscing more than ever. If any of you know where I could get in touch with Barbara Pierce who used to go to St Clements and lived on Ashton-Old Road across from the school I would appreciate it. Bradford is now the ‘Etihad Campus’, named after Manchester City’s sponsor! Ancoats is now ‘New Islington’ to the new flat owners at £250,000 a pop. 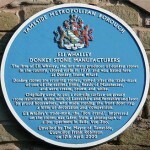 To me it will remain Bradford and Ancoats! The baths are long gone. The park is there but not as you remember. All plastic no grass. 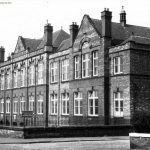 I was born in Crumpsall Hospital in 1949 and lived at 164 Charlesworth Street until I was 7 years old, we then moved to 112 Barmouth Street opposite a day nursery and on the next row to Barmouth street swimming baths. I remember the film A Taste of Honey being filmed in the park next to Grange Street School, does anyone remember the Dixon family who lived at 162 Charlesworth Street and the Gilligan family at 166 they had 4 children Walter, Edith, Pat and Bobby, would love to hear from anybody who remembers me or any of my childhood friends. just surfing the net as you do and came across site. i have fond and sad memories of living there. our house backed onto the green that the houses in south street backed onto so all played there I remeber bonfire night logg for somthing to burn and making dens with the goodwins and the dougdales i was best friend of Christine Dougdale i really loved her she was so clever and beautiful her mum and mrs goodwin were my saviour they looked after me when i accidently cought my dress on fire they knew exactly what to do and they went with me all the way to booth hall hospital will never forget their kindness. lost touch with Chiristine. i went to Elyshion st school i dont remember many boys or girls from there i think i wasnt very popular i did play a fairy in the school play though and still remember what i had to say till this day. i also worked in the Woodyard at the top of south street im not too good with the street names in those days as long as you knew where you were that was ok i was bundling up those Parafin sticks on a Saturday and then afterwards we would put on a little show on the big stacked up tar ridden sleepers i left machester at 17 caught a train on my own and went to live in kent still their now do come home now and again to see all my family which is now spread all over Manchester area denton ,stockport, wythenshaw, altingham gorton and littlie old me here on my own i do have a son and two grandchildren so not alone really. 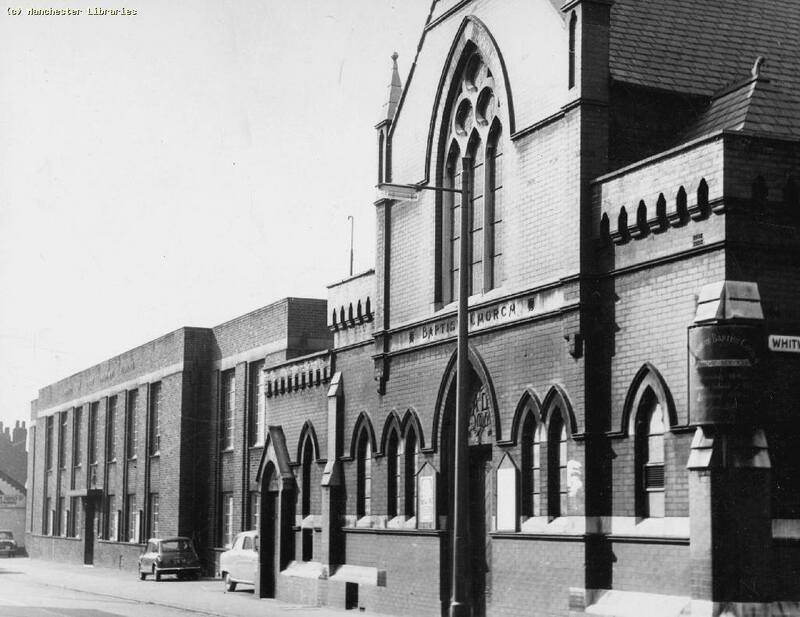 omg i didnt know they have pulled down the swimming baths i always said if i won the lottery i would restore it well thats put paid to that i probably will never win the lottery anyway. well everyone who reads this sorr if ive gon on and on but got loads to say this is just the tip of the iceburg and my grammer is much to be desired. If I am not mistaken you had a brother Paul who was in my class at Elysian Street? The last bricks of Whitworth St baths were removed last week. I stopped and looked the hole in the ground that was once so full with kids you couldn’t enter the water! The ‘Godwins’ and the ‘Dougdales’ were prominent families in the area and I remember the kids of my age fondly. Janet , are you Normans sister ? A still from Coronation St was posted on the Openshaw Facebook page some time ago, might have been a year or more, and I think I remember that there was some discussion about the record sleeve and the shop. I don’t know how long stuff stays on Facebook, but even if you were to scroll down all the entries on the site to look for the one I’m referring to, it would take you a very long time. I suggest you post a query on the site and see if anyone can find the original post. If you’re not a member of the Openshaw Fb page, it’s very simple to join, and then you can post. Most names are familiar the memories of Openshaw vivid. I walked past ‘George St Park’ only last week to see some friends who are still loyal to the area. Greggs Bakery is now an employer where the site of the ‘English Steel’ once reigned supreme. As with all of Manchesters poor areas there has been an influx of new faces. They are just poor people looking for a better life like we were. The difference being they come from other countries. The shop on Hovis street is still a shop! Well done the Potters for staring the legacy. (George, Eileen, Ian and Barrie) Gate St is all but gone. A new estate runs along Victoria St.
Matalan is where B & S Massey once stood proud. The Gorton Tank is now Smithfield Market and has been for many a long year. All pubs are now gone. 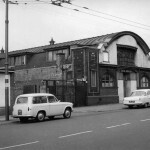 The Vulcan, The George, The Drovers, The Wrexham, The Lord Wolsley, The Legh Arms and many more now grass or a Subway… For real memories check out the Manchester Council Archives. Truly brilliant and will keep you spellbound for a month of Sundays. Last week I saw Whitworth Baths disappear as the demolition crews moved in. What a piece of Openshaw history removed in a few weeks. Crossleys stand proud, although run down next door. A friend to everyone within a few miles of its welcoming doors – let us not forget Mr Antrobus also despite the names mentioned previously. The Etihad Stadium and training facility is where Bradford Pit and the Clayton Aniline once stood. Even United fans have to admit City have been good for some Openshaw folk and the area in general. For those who are not ‘up to date’ on certain names mentioned in this thread let me enlighten you. As is life, not all good news. Kenny Barnes passed away around the age of 41-42 in Openshaw where he lived on the village. We were friends up until the time he died but I was working away and missed the funeral. The Ridings family (Steve Petty will remember) lived in Vincent St, then on the ‘Village’. The father, Jim, passed away in the early 2000s’. The mum, Norma, passed away seven years past. The children, Lenny, Jimmy, David and Christine are mostly local. John Longsden has done much for Openshaw and Bradford as the local councillor for many, many years. He is currently battling cancer and winning for a second time. My thoughts and prayers are with him and his lovely family. Alan Wilkinson (Staton St) is a father of 4. All have passed through university. He is in Audenshaw. The Godwins, also one for Steve Petty, remained in the area for years. (Dave, Bobby etc) John Godwin lives in Abbey Hey, Gorton near the new ‘Wright Robinson’. Brian I have not heard of for 25 years. The Marsden family, Brigham St, are still in the area (Fred, John, Elaine, Dave and Glenn) I saw Dave around 12 months past on Ashton Old Road. Jonathon Buckley, Elysian St, I believe, is in Audenshaw. I saw him in Denton a few years past. His sister Anita, I have not seen since school. Hope these names and places jog a few memories. know the answer to my curiosity. Being a regular viewer of Coronation Street I am intrigued by a record sleeve on the wall in Roy’s cafe. now this could be no more than a bit of clever set design but to me the sleeve looks genuine. I wonder if any of your contacts recall a record shop by this name in Gee Street ???? I have to admit I know little of TV’s Coronation Street although my wife is a big fan. To live a life such as ‘David Platt’, as an example, you would have to be 300 years old! Not in any way a reflection of the Openshaw I grew up in years ago and especially not now. Ten businesses in one line of a street! Do me a favour. Most inner city mancs I know have the same opinion. 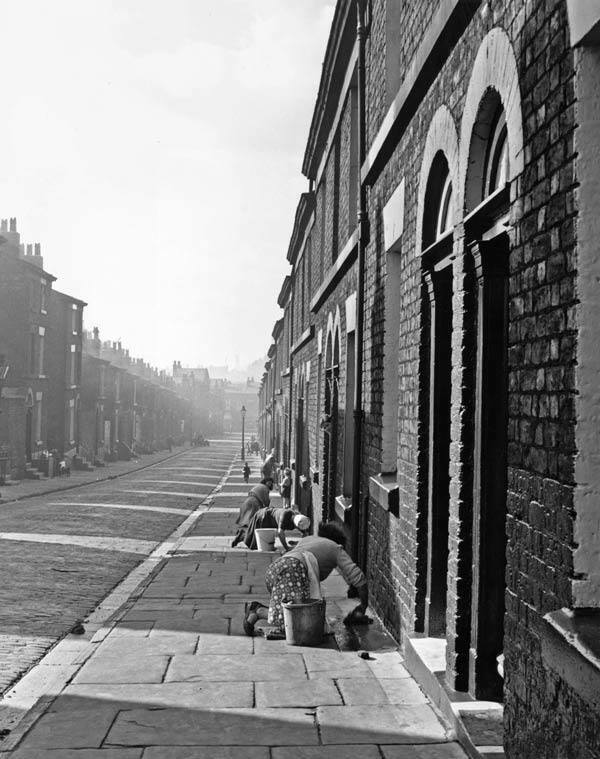 My life as a child in openshaw, when daylight was gone and football finally put away for the day in the backyard, hours were then spent around older people in an effort to avoid bed, my gran enjoying a ‘Mackeson’. I listened to them reminiscing about the ‘olden days’ or the ‘cold and damp’ over a ‘nice cup of tea’, the one constant in every home. What I do remember vividly in the summer months was the ‘red clouds’ released from the ‘Clayton Aniline’. (Usually at dusk but never in the day) Toxic by design but unbeknown to us, the chemical plant would send clouds of swifts or swallows crazy in summer over George St Park as its sinister ‘red dust’ presence disoriented them. They flew in circles for many a long hour as the sun set behind them. My father knew then what was messing with there sense of direction but i was to young to understand the poisons he spoke of. I often wonder how much of it was released into the atmosphere and came to rest over the good people of the area? I remember waking up to my mams ‘pink stained’ washing, left overnight on the line, stained by the same cloud, as I made my way to the outside toilet. 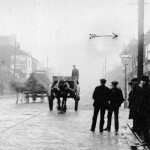 Despite this I cannot help but view Openshaw through rose tinted spectacles despite the poverty, or at best, hardship. The heart fell out of the area it in the Thatchers years when 80-90% of the heavy engineering jobs disappeared. In 1980 we received the ‘Village’ estate from the government as Openshaw was reduced to rubble in the 1970’s to populate the new ‘Hulme’, ‘Hattersley’ and ‘Gamesley’. A monstrosity estate that was a no go area in the 1990’s due to the drug trade and drug wars. When I was a boy ‘Higher Openshaw’, over the ‘bridge’ that spanned the ‘cut’, the canal, was an alien world to me until I was 12-13 years old. We looked on them as ‘posh’. Some of ‘their’ houses had gardens, none of ours did. Ashton-U-Lyne was a world away. Ashton indoor market was my grans treat every six months. I could only look longingly at the toy model shop and dream. They were well above anything we could afford. 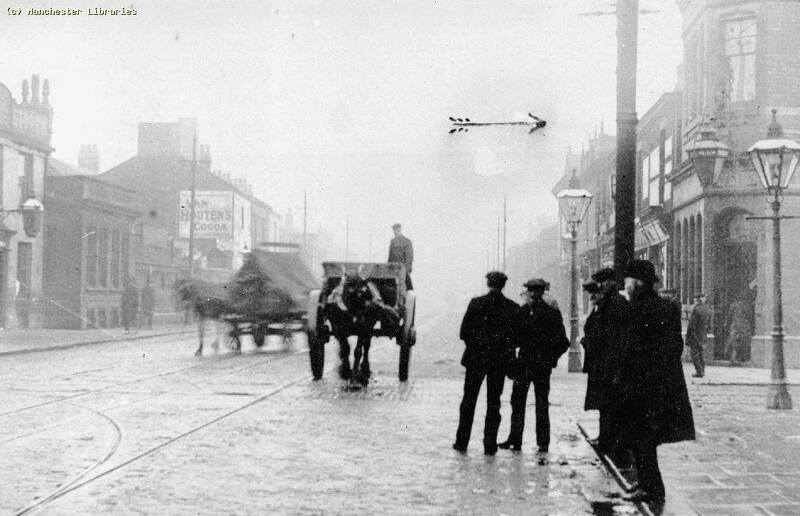 Droylsden was known as an area for ‘in-breeds’, a terrible slur that grew up falsely with the ‘Clayton Wars’ between rivals gangs at ‘Clayton Tip’. The Ashton dialect with its broad ‘brogue’, although only 3-4 miles distant from where I grew up, was a great sense of amusement to local Openshaw kids. It is amazing how different it is from the inner city ‘Manc’ accent. Even today I listen with a sense of amusement, but with respect also, as many came to be friends of mine in later years and reversed it to make us sound ‘common’. Funny old world. I could wax lyrical for hours. With friends still in the area, they do not share my outlook. I travelled with work and left the area as a young man. They stayed and have lived with the daily grind that hardship fosters. I spoke at length with friends just this Easter. The beer is a great ‘softener’, the hearts still as warm, many are gone, many have passed through the system unscathed and held jobs, as many have not and it has passed to the next generation. There is hope still and optimism remains. As my mate intoned ‘Beer eh Bry…still the bain of the working man…’ It was my fathers voice rekindled as we enjoyed each others company. Good people then and now. Born on South Street in 1957 and went yo Elysian Street school. I tried to track Barbara down but when I called at the only address that I could find it turned out to be a different Barbara and I have not seen anything of her since our chance meeting. Sorry. Yes I moved to Poynton to be closer to my daughter and family five months ago after losing Darrelle early last year after nearly 49 years of marriage. I assume it was Poynton Pool where you went fishing although there is part of the Cheshire Ring canal system at Higher Poynton. It still has a pleasant village atmosphere and I hope that it stays like. From previous messages all seems to be well with you. Sorry to hear about your wife, I know how it feels Alec I lost my lady 2 years ago. I hope 2017 as started good for all you guys, enjoy life. Miss Bostock was another name (Bossy socks) I recall. Miss W (the organist) I still get a Christmas card from her daughter Dorothy. Can remember reading The mill on the Floss with her and Moonfleet with Mr Ormiston. Just come across this site in a roundabout way. I also went to St Clements in 50s and knew Mr Godsall and Miss Openshaw and Miss Kilburn (Binner) Mr Milne, Mr Ormiston etc. We also got married in the church there. I visited Olive when I was in Adelaide and we kept in contact by email and Christmas cars. When I did not get one last year I presumed she had passed on. Keith I remember your name and Brian’s. She spoke fondly of you Keith. There was a very sad documentary about Jean Binner’s son last year who died of Motor Neuron in Switzerland. I remember you as a skinny kid. Looks like you have made a good life for yourself, well done. I went to Blackpool Grammar School but left before taking my exams as my Dad died just after my 16th birthday so I needed to get out to work to earn some money. I was a butcher for a few years, met and married a girl from St Anne’s, we are just coming up to 50 years married, then joined the fire brigade. Thankfully that was a success as when I retired in 2000 I was a senior officer in charge of 14 fire stations in Lancashire. We moved to Bury in 2001 from St Anne’s, most people move to the seaside when they retire we went the other way to be nearer family. Life is pretty good especially when you hear of people like Alan, Bobby and Eddie, we have 2 children, 3 grandchildren and are soon to be great grandparents. Hi Brian, my husband Charles thinks your name rings a bell with him, he knew Alan Boardman, Keith Hindley and Bobby and Geoff Underhill. The Underhill brothers were best friends with his brother Eddie Whalley, my husband’s grandad Fred lived on Bowness Street at number 30, do you remember my husband’s brother Eddie who sadly died in 2005 and lived in Heywood. Charles said Alan Boardman passed away a few years ago. Just wondered if you remembered Eddie. 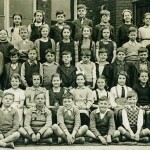 I came across this site whilst looking for an old photo of St Clements School and found some very interesting comments. I went toSt Clements including the infants in the wriggly tin school on AOR and then to the junior school leaving after taking the 11+. I still have a photo of our class from 1958/9 with Miss Openshaw who some of you have mentioned. A few of the names I remember from that photo are Alan Boardman, Wendy Morrison and her friend Beverly Richard Tipping Kieth Hindley and the Underhill brothers. I don’t know if anyone remembers me as we lived at 49 Silverdale St but moved to Blackpool in 1959 because of the Manchester smog and its affect on my dad. G-Day Brian Booth, how you? Its been a long time since we where at school. I turned 70 last 3rd December but still going strong.What are you getting up to these days? Chris Swindell how are you? I remember Tommy Torr he had a vegetable outlet and I used to go and get the veggies for my Mother. !0Lbs of spuds was heavy for a little taker like me back then. Tommy Torr was my Great Grandfather and although he died long before I was born I was told many stories by my grandparents (Lillian Torr and Thomas Frank Swindell) of the shops he owned and how everyone knew him. My father (Frank Swindell) went to Varna street school around the mid to late 1950’s. I would love to hear from anyone who remembers my family or who has any other pictures of the Torr shops. http://www.twitcherscorner.com you should go and have a look. 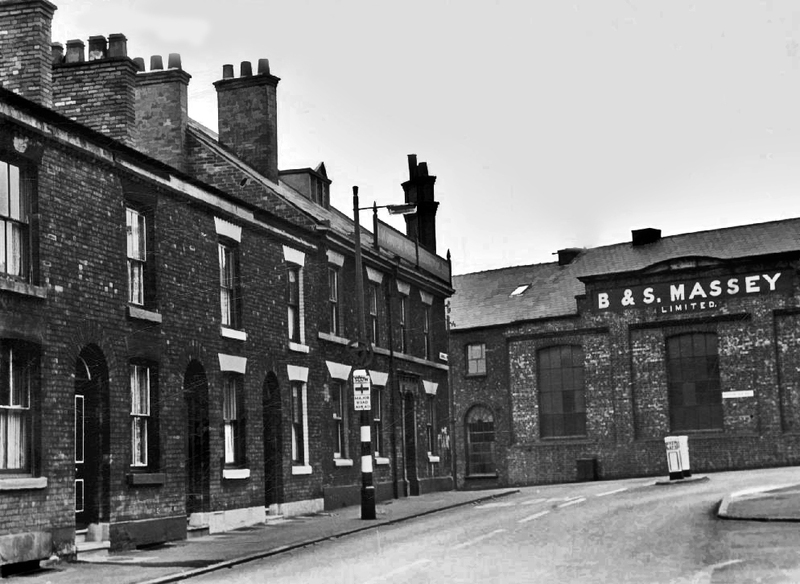 I used to live at 14 Barn Street just off Ackroyd Street but its all gone now along with good memories. Dear Keith, sad news about Bobby, Geoff and Bobby were good friends of Eddie’s like yourself. Mr Godsall was a tough but fair teacher. He loved cricket because he was a cricket teacher at school, bet thats why he moved to Oz. This Miss Openshaw was her first name Diane and did her parents have a pub in Openshaw near Fairfield Wells. I bet the wildlife in Australia is good to photograph, my hobby is restoring old woodworking tools, got hundreds!, garage is full wife goes mad. Hope to hear from you soon G’day (is my australian good). Regards Charles. Mr Godsall lived in Tasmania for many years but he passed away about 25 years ago. I was also a very good friend of Miss Openshaw if you remember her. She moved to Adelaid back in the 70″s but she also passed away last year.I remember Alec Broughton also Geoff Underhill who I think moved to Ireland. Someone told me a few years ago that his brother Bobby had died but I can say for definite. I live in a town called Frankston which is about 60 Ks south of Melbourne on the Mornington Peninsula. I was at St Clements from 1956 to 1961 then whent working at B & S Massey. I left England back in 1975 and have been living in Australia for the last 41 years. Would be great to hear from a few of you guys. Charles Whalley, I knew your brother Eddy realy well. We all went to Parris with the school and Eddie walked through a glass window but never got cut.I live in Melbourne australia and my email addess is keith.hindley@bigpond.com call in and say hi. Nice to hear from you again Keith,heard from a few of Eddie’s old friends. I dont know if you knew Alan Boardman but he sadly passed away a few years ago, Not heard off Geoff or Bobby Underhill yet or Mike Burtenshaw i imagine you knew them or Alec Broughton. I believe Melbourne is a nice city are you far from there. I remember Mr Godsall, how long was he in Australia for? Keep in touch, bye for now. Just scrolling through memories of Openshaw and came across your message and saw my name I remember you but it was Eddie I new from school and the Boys Brigade. It was nice to read names from the past Bob, Jeff, Kieth, Dave etc and the teachers. Great I have just moved from Romiley to Poynton. Thank you for your reply, pleased you remembered me. I have fond memories of Eddie and was so sad to hear he passed away at such an early age. I new about Billy and Alan but not Bobby. I keep in regular touch with Alan Mort from St Clements and the BB and Dave Adams and Glenn Turner from the BB days. I spoke to Jeff a year or so ago when he was over from Ireland for his mums funeral. I also spoke to Keith by phone a few years ago. Keith if you read this – hello. I will keep an eye out on the site for any body else I remember. Cheers Alec. Some time ago you was going to track down Barbara Pierce but i didn’t hear from you. Was you able to find out her address at all or even a phone number. How are you keeping? I see your in Poynton now, i used to spend all my time there fishing as a kid but Melbourne a little to far to go for a days fishing. I lived at 938 we had a sweet shop and went to Elysian from 1960-1963 and then Varna St. from 1962 to 1968. My sister 4 years younger, was Janet. I remember Keith Astbury as someone who was always getting in scrapes and seemed to have a perpetual septic knee. 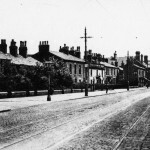 We had to move because of the slum clearance programme which they called “road widening”. We had one tap and an outside loo, no bathroom and washed in the kitchen sink and had a zinc bath stored in the yard which i had weekly. The malt loaves rings a bell!!!! The whole area was an awful dump but I didn’t know any better in those days so it didn’t matter. My best friends were Paul Bowers who i went to Belle Vue with every week and Graham Robinson of Coronation St who had a brother called David. I knew a peter Stubbs n Vine Street who was a classmate at Varna. I lived at 20 Craydon street I went to Elysian street school in the early 60’s, due to ‘road widening’ we moved to Dukinfield in 1965, probably went to school with Tom Brearley but can’t remember, used to remember seeing the train from English steel going along wood street, and the yellow smoke which turned the washing yellow. 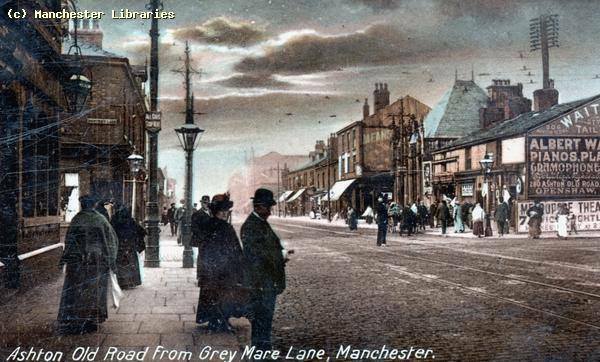 Had a friend called Karen Evans who lived on Marple street, my Dad worked at Crossleys and remember my mum going to the washhouse on Ashton old Road on a Saturday. Good memories. Was born in the front room of our house on Sandywell St in 1970, but moved to Wythenshawe in 1971. Remember my dad telling me the kitchen was infested with cockroaches… glad I can’t remember..!!! like to hear from you & any other old friends. Do you remeber Billy Beswick a good footballer like me?. 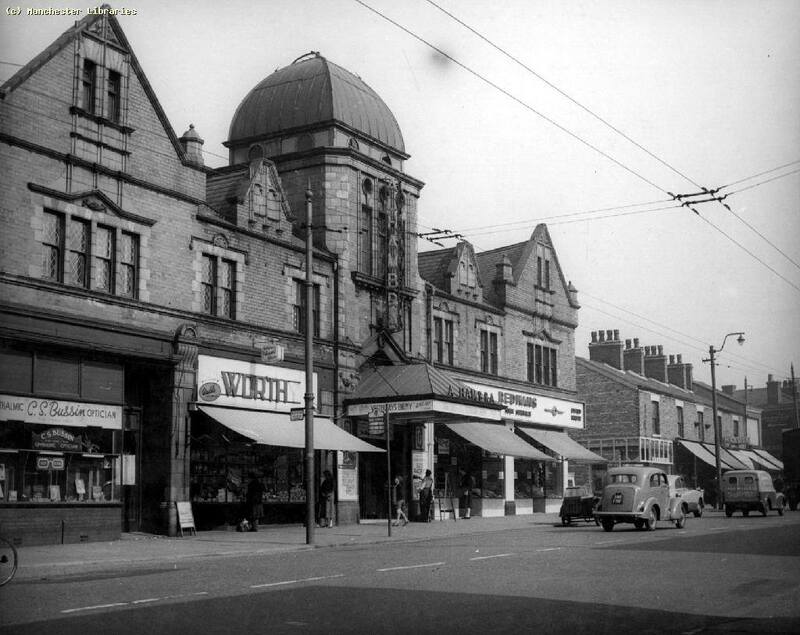 I lived in Widnes Street facing the Rex on the other side of Ashton Old Road. At the bottom of my street was the ‘Bird Cage’ – wonderful memories of standing on the bridge over the railway lines waiting for the trains to come along, and then being engulfed in the steam from those fantastic railway engines. 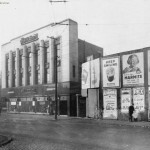 Strangely though, I used to go to the Alhambra rather than the Rex, even though the Rex was literally on my doorstep. The 3 Stooges stick out for me. On the way back from the ‘pictures’ we would nick malt loaf which was cooling at the back of a bakers very close to the Alhambra. Brilliant times, even though there were no luxuries. I also recognise some of the names mentioned on here. The fireman at the Alhamra was called Harold Bentley. I knew him in the 70s80s when he drank in the Lord Raglan (the rag). 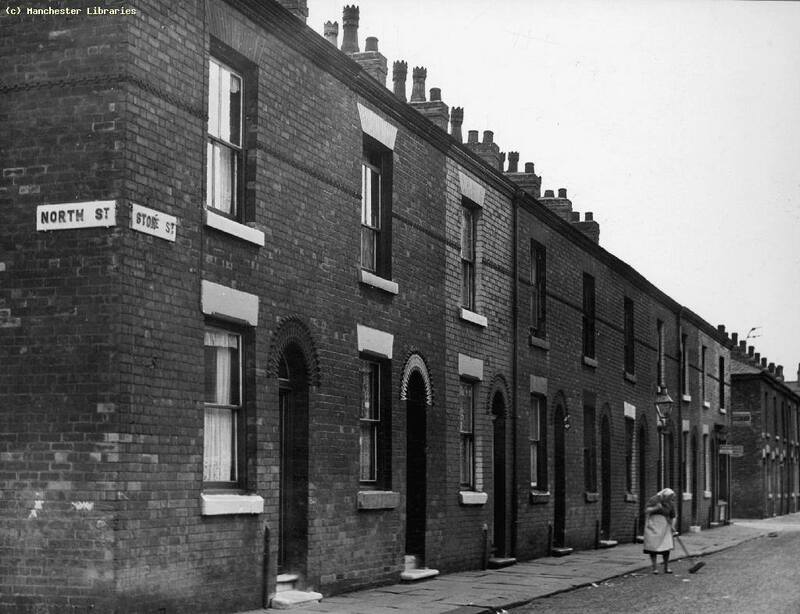 I lived in Toxteth St, Higher Openshaw. Can anyone tell me what the name of the pub is on the ‘Sandywell St to Tommy Torr’s’ picture above. 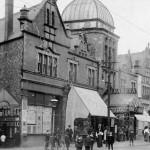 It is just about visible after the T Torr & Sons shop. Was it called ‘The Grapes’? Helen, the pub was either The Blue Bell or The Grapes. Both of these pubs were demolished in the early 70s. 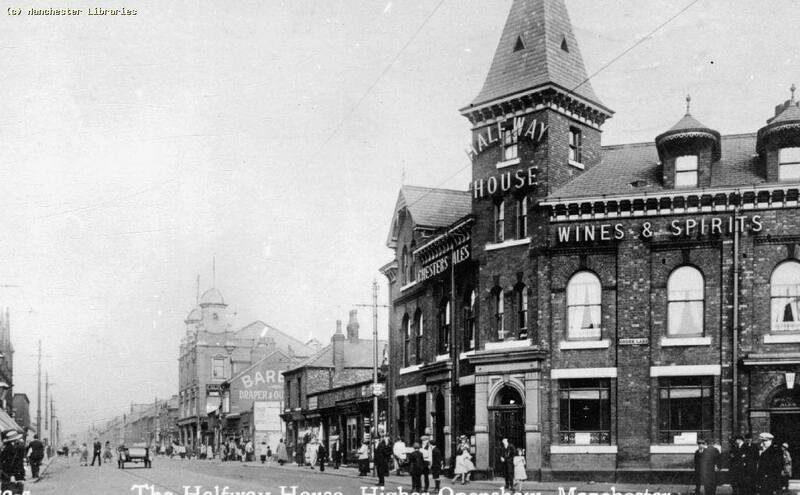 There were a couple of other pubs along that side of the Old Rd near there one was the Prince of Wales and the Pack Horse on the corner of Louisa St. These were still in business well into the 90s. It later became a restraunt. I can tell you that the pub was definitely The Bluebell, they sold Hydes Anvil ales. i used to go in there a lot as i could get served there even tho’ only 15 at the time! 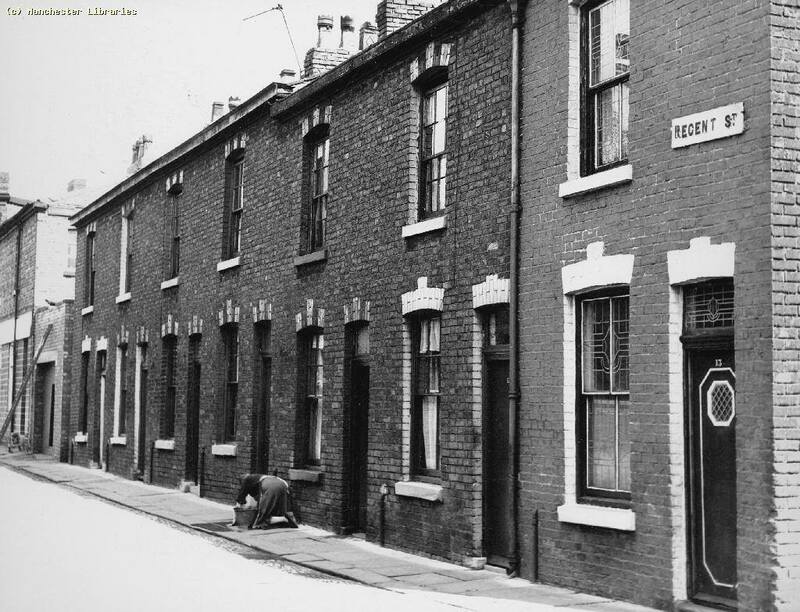 My Mum lived on Cornwall Street during the late 50’s/60’s. Her Mum ran a shop. My Mum is called Jenny and my nan was called Betty (married to Arthur). I don’t have much information but it would be lovely to find a photo (if any exist) of the shop. I will keep checking this site and I will also show Jenny. I was born in Orrell street and grew up there ,I went to St Vincents school !I worked at Laurence Scott for a time and Patent knitting company nursery !we moved away to Wythenshawe when they demolished all the houses in Orrell street in 1958 !!!! 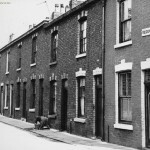 I lived in Vine St on the first row after the market in them days it was always referred to as the Doctors row. The picture of Tommy Tors fetched back memories he had the shed separating the markets on Stanley St facing Catherine st my Mam worked there on market days, I can not remember if he also had the shop at the same time. The Rex was great the boos when they put a crap film on the cheers if it was the three stooges. I would have hated cleaning the place up the amount of stuff that got tossed into the camera lights went home early many times after getting chucked out. G-Day Harry, Keith Hindley here. I used to live in Barn Street No 14 and remember the Doctors on Vine Street the was Dr Galliger and Dr Scott. Do you remember on the corner facing the doctors was a wooden shed that sold Ice cream. They where good days. We didn’t know how poor we where and it didn’t matter. 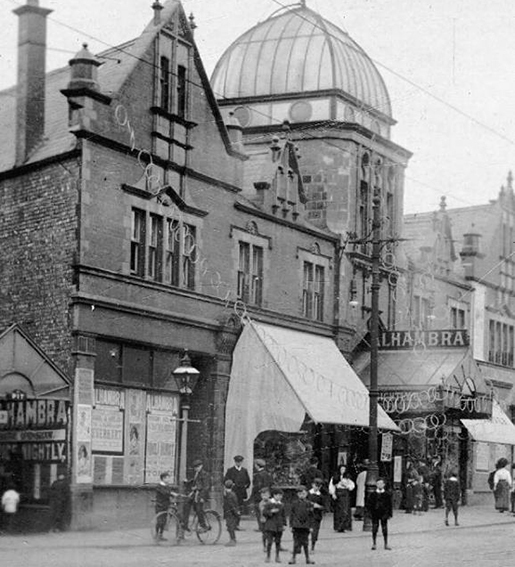 Hiya, my family were called barber n I have a feeling the big building that has barber on the gable end in the main picture was my family. 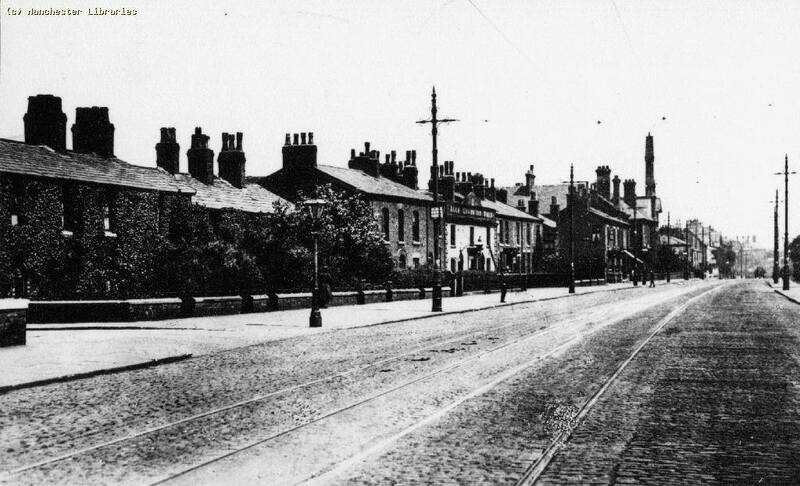 I,m aware that st is called barber st. My great great grandfather was a chemist/druggist in the late 1800s/ early 1900s and his son had a number of drapers shops knocked into one on ashton old rd. the chemists was somewhere near barber st. 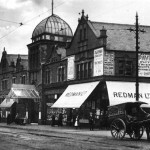 They must have been quite well known round opens haw n would be interested in any old photos of my family,s businesses. The census from 1901 give the details. The chemist was called robert barber fron clay ton, but he died about 1890s n his wife, Martha, carried on the family business. Their son was called, Charles. Would love to hear anything about them or photos. Thanks. 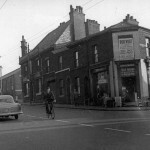 I was a member of Openshaw Lads Club in the late 50s early 60s. I played 5 a-side and 11a-side for the club Also enjoyed table tennis and snooker in the club.I was there when Frankie Vaughan opened the new coffee shop.I went to Jersey twice with the club. I went to St Vincents school. I remember you David (Selby). I remember you going to Jersey and your mate Adge.I went to school with John Longsdon who I think lived at the back of you.Hope you are keeping well. 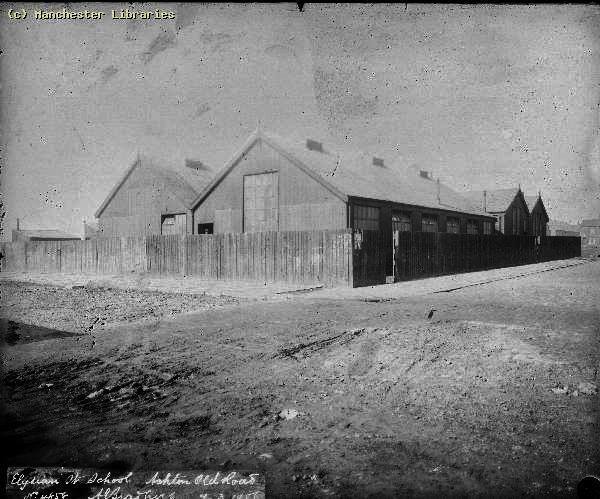 Do you remember Openshaw Lads Club on A OR right next to the wash house in Whitworth Baths. We only lived round the corner on Vincent st so me and my brother Raymond spent every hour we could playing football, table tennis Tec. You name it we did it.They organised holidays to Jersey, Weston Super Mare for less than £7. The manager was called Mr Harwood, really great man. Happy days eh. At the Alhambra, do you remember the “fireman” ( a male usher) with the metal arm? He would tap misbehavers on the head with it! I used to stand at the back of the cinema in my St Johns Uniform, it was a great way of getting to see the movies for free. And I do remember the guy with the iron hand with a black leather glove on it. The last movie on the Alhambra we “I’m alright Jack” with Peter Sellers. I also used to know David Jones from the Monkeys we used to meet on the red rec. His best mate had a fish & chip shop but I cant remember his name. David died a few years ago with heart attack. I have happy memories of the Rex on Saturday mornings, with hordes of screaming kids. Apart from Flash Gordon and the cowboy pictures, I used to love Abbott & Costello, laugh till your sides hurt. I’ll do a short post later on cinemas-we did rather well in Openshaw, three in a very short distance. I have memories of the Rex cinema that come back from seeing the picture. I lived on Ashton Old road, my parent had a Sweet Shop. Every Saturday morning we would go to the children’s showing – Roy Rogers, Flash Gordon Hopalong Cassidy etc. (I eventually ended up living in the American West for 8 years and got to relive those cowboy and Indian games.) 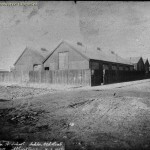 We used to have to queue round the side – you can see the gate on the photograph. Being a bit on the wild-side, my friends and I climbed over the wall to play in the woodyard that was next door. I unhappily, fell through the roof and broke my arm. There were at least two woodyards that I remember. I suppose they were there in the 1950,s to recycle timbers from bombed out buildings. One I remember made firelighters – a bunch of sticks around a clump of paraffin soaked sawdust belt together with twisted wire. Once the memories come, they just keep coming. Hi Tony, Ive been trying to trace my Uncle Tommy’s family (my Dad’s brother). 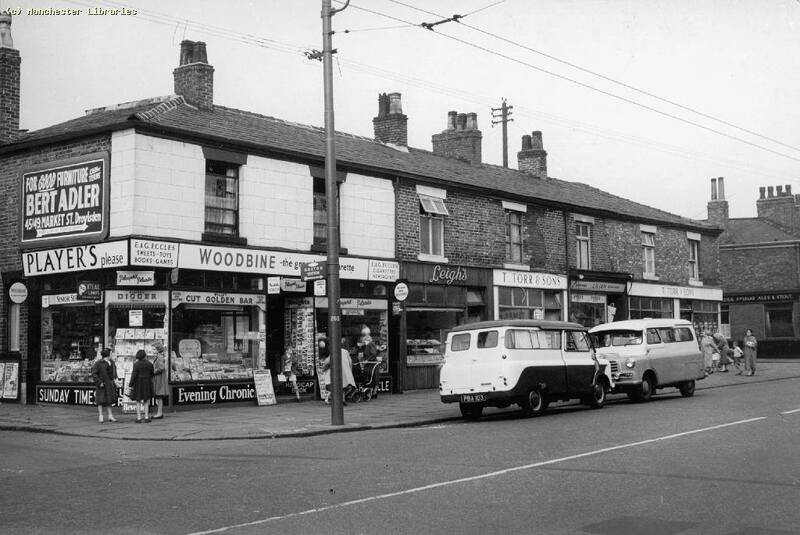 He had a shop on Ashton Old Road in the 50’s and maybe the early 60’s. It was a wireless shop which did the accumulators. It was called Tommy Johnsons. He had two son’s as far as I know – Tommy and Charlie. Have you any knowledge of them. I too have memories of the Old Road – we used to go to the Apollo in Ardwick Green on Saturday morning and the Queens on a Saturday afternoon and frighten myself half to death watching that bloke with the cloak and big hat’s shadow. I’d appreciate any feedback. Many thanks..
Where on AOR was the radio shop? My Great grandparents had a similar shop up at Fairfield Wells, near to Manshaw road, in a small cottage, one of a row of 3 IIRC. (Opposite the ‘tram office’). They were open until maybe early 60’s, I don’t remember the business being open. Actually, it was not a shop as such, but something they ran from home, they had a small booth off the hallway inside with a curtain across, they were agents for Exide and Ever Ready batteries, and still had the battery testers and enamel wall adverts inside. Now long gone. Hello Gina.. Browsing, like you do, looking for old friends, schools, from Openshaw in the 50s/60s etc. I came across this site and your comment. 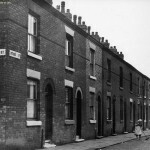 I was born and lived in Nuttall Street which is still there today ! empty of course. 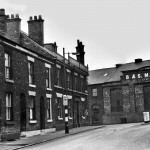 It lies between Ashton Old Road and Whitworth Street. Charlie Johnson was one of my best friends including Geoffrey and Grahame Heathcote, we all went to the same schools and played together back then. Blackie brook, Wicky wall, the sidings of Ashbury railway was our playgrounds. Raymond Tierney was also a friend, he lost a leg when We all lost touch when we all got relocated. I moved to a new house in the Wythenshawe overspill ( trees , flowers, grass and birds .. wow ! ).. 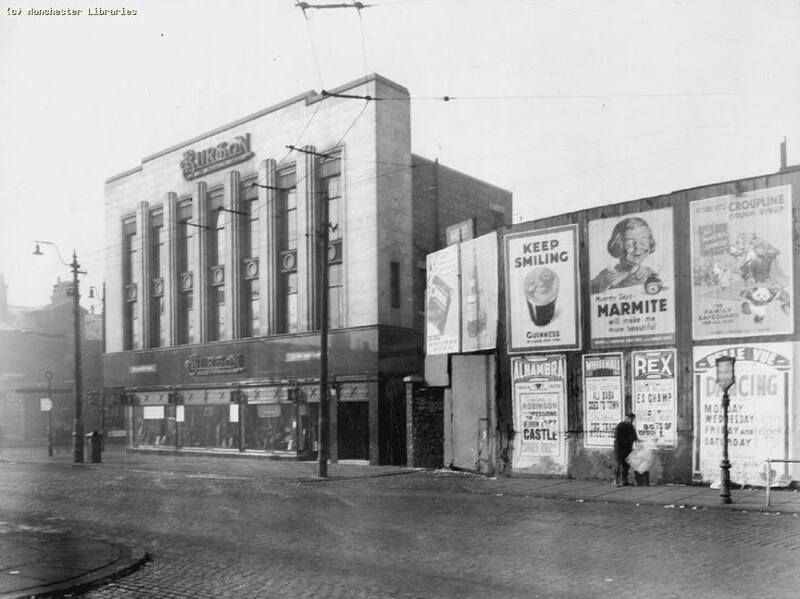 Went to the Queens sometimes (our neighbour Joe Bell was doorman there ) but our main cinema was the Metropole or the Princess (later a night club) Did you manage to get any feedback from your request? Got distracted by Harry and Megs wedding !!! Thank you so much for putting these pictures on the internet. 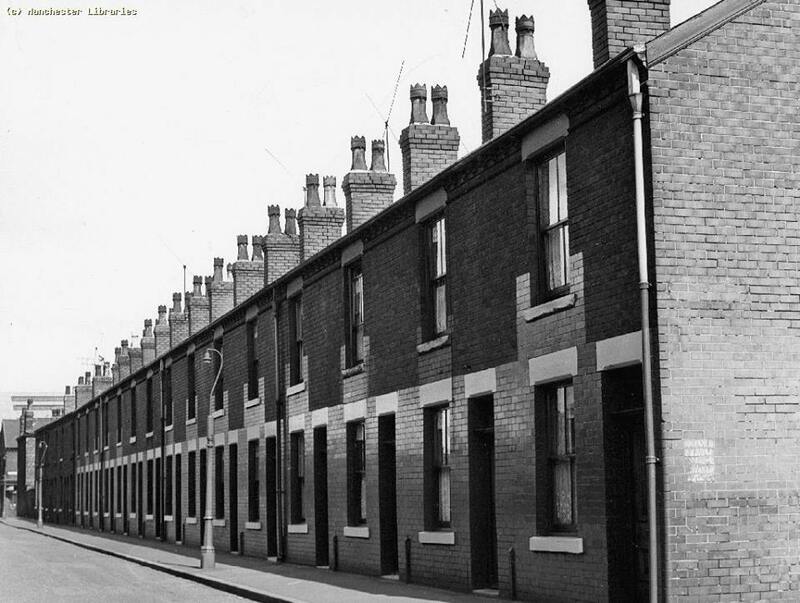 I grew up on Sandywell Street in Openshaw in the 60s-70s and it was wonderful to see these memories.